Mongolian Beef - a quick & easy recipe for a take out favourite at home! Mongolian Beef. A quick and easy recipe. People love this dish for its balance of sweet and salty flavours and this recipe has just a little extra zing. 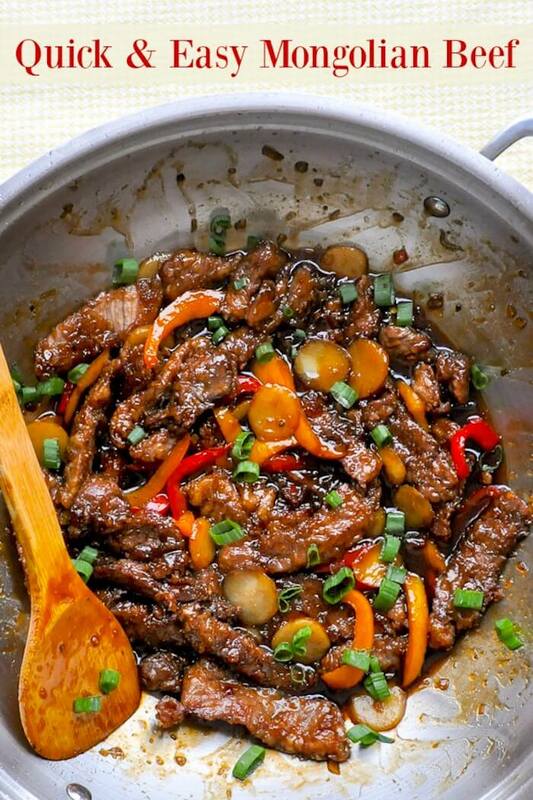 Mongolian Beef; here’s another Chinese take-out recipe that you can easily make at home. Mongolian Beef is one of the most popular dishes on many Chinese food restaurants in North America. As with many dishes we associate with Chinese food in this part of the world, it has almost nothing to do with authentic Chinese cuisine and is purely a North American invention. Nonetheless people enjoy this dish for the delicate balance of sweet and salty which only the best restaurants get right. I’ve tried many recipes before and to my taste they fall on either the too sweet or too salty side of the fence; for my money, this is the best one I’ve tried yet. Still, tastes vary and you may be more inclined to the sweet or salty side of the scale with a recipe like this one. 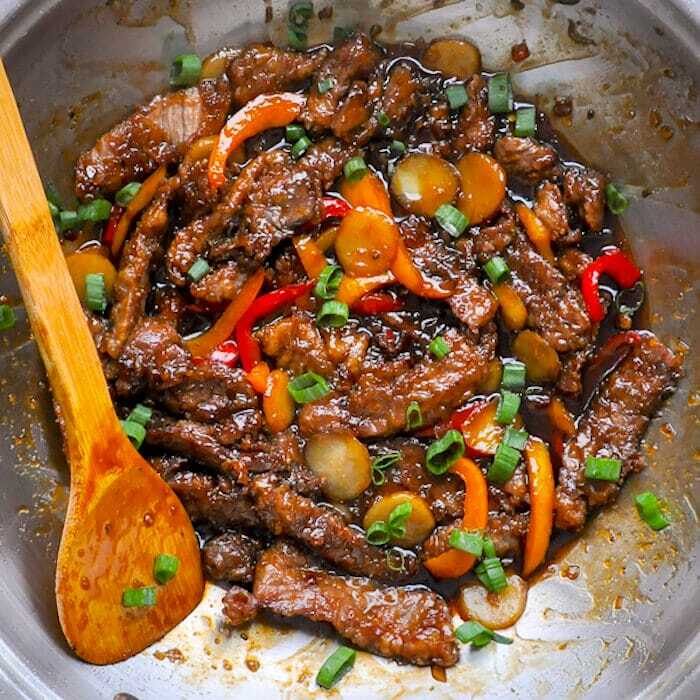 My suggestion is to try this Mongolian Beef recipe as written and then adjust the brown sugar to add more sweetness or the soy sauce to add more saltiness the next time you make it. The recipe is also very adaptable to any vegetables that you have on hand that you’d like to add to it. Steamed carrots, broccoli, snow peas or cauliflower would all be great as well. We always have to have the water chestnuts at our place though; my daughter Olivia insists on them! While many recipes you may find for Mongolian Beef do not add any spicy element, I actually do prefer it with a little bit of a kick, but if this is not to your taste, the recipe works perfectly well without the added chili paste or flakes. If you want to avoid the frying method, this recipe works well as a stir fry too. See the note in the recipe for those instructions. If this is your type of recipe be sure to check our our versions of General Tso’s Chicken and Chinese Take Out Style Orange Chicken…and if you’re a noodle fan, be sure to try our take-out copycat version of Singapore Noodles too. 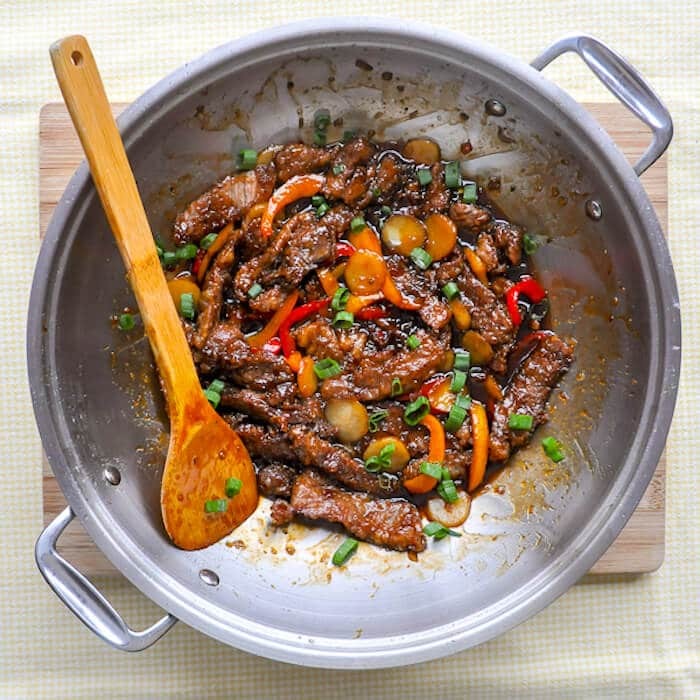 Like this Mongolian Beef recipe? You’ll find hundreds of other great ideas in our Quick & Easy Dinners Category and even more in our Asian Inspired Recipes Category. Since I use an electric stovetop I prefer flat bottomed wok for this recipe. I find it to be much more stable and easy to use on the stovetop. I also like one that has a lid which is great for steaming the vegetables in a stir fry to speed up the cooking time. 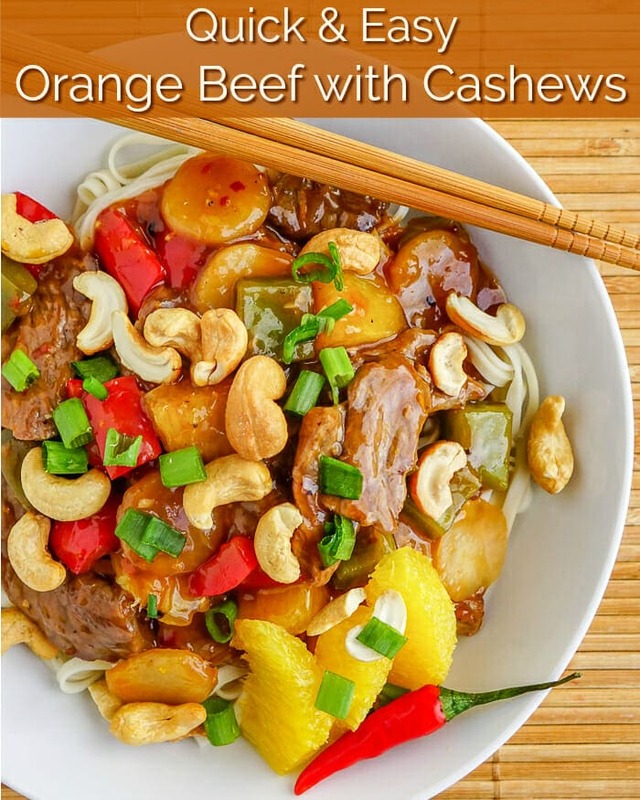 You might also like our popular recipe for Orange Beef with Cashews! 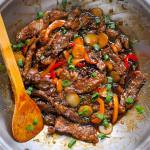 Mongolian Beef - a quick and easy recipe. People love this dish for its balance of sweet and salty flavours and this recipe has just a little extra zing. 1/3 cup corn starch maybe a little more. Try not to use beef straight from the fridge or you will cool down the oil too much when frying. I like to take it out to sit at room temperature for at least a half hour. Cut the beef steak, across the grain, into 1/4 inch thick strips. Heat the oil in a hot wok to 375 degrees. Fry the steak in about 3 batches, so that it cooks very quickly. It only takes about a minute or so to flash fry the beef. Pour off the oil from the wok completely. Add the beef back to the wok along immediately with the vegetables and sauce and simmer for only a few minutes before serving over steamed rice or your favourite noodles. I like to make the sauce quickly in a large sauté pan so that it reduces and thickens more quickly. In a small bowl, or large measuring cup, stir together all of the ingredients for the sauce, except the garlic and vegetable oil. Heat the 2 tablespoons of vegetable oil over medium heat and lightly sauté the garlic for only a minute, so that it softens but does not brown. Add the combined ingredients to the pan all at one and simmer for 5 minutes or so until the sauce begins to thicken. Turn off the heat and set aside until the beef is cooked. The corn starch flash frying does help to evenly coat the beef in the glistening sauce but if you want to avoid the fried version of this recipe try making it as a stir fry instead. Prepare the sauce first, so that it is properly reduced and thickened. Add 3 tbsp vegetable oil to a hot wok and quickly stir fry the beef before immediately adding the vegetables and sauce and simmering for an additional few minutes to heat the vegetables through. The critical thing is not to overcook the beef. The wok should be as hot as possible and the beef need only be quickly stir fried for a minute or so until it looses the pink colour to be fully cooked. the extra few minutes of simmering will guarantee that it is anyway. Previous Post: « Lemon Thyme Roast Chicken – brined in lemon, spices & thyme. HI, you might edit the ingredients list for cornstarch and the oil. Question re canned water chestnuts – cooking for only one I always have water chestnuts left over – have you ever frozen them? And if so, successfully? I like the easiness of this recipe, thanks for posting. Never frozen them but don’t see why not.